Despite Turkey’s clearly hostile and unyielding position on the participation of Syrian Kurds in the Geneva talks dedicated to the settlement of the Syrian conflict, the Kurds will most likely be a qualified party to the negotiating process after all. Two factors contributed to the favorable development of the situation. A successful participation of the Kurdish militiamen in the struggle against radical Islamist groups, and a consistent and firm position of Russia on this issue. The Russian side maintains an opinion that there should be as many representatives of Syrian political, public, ethnic and religious groups participating in the Geneva talks, as possible. If interests of some group are not accounted for at the time of negotiations, the peace process can be crippled or worse—ruined. Sergey Lavrov, Head of the Russian foreign policy department, thinks that Kurds might secede from Syria if they are not allowed to participate in the inter-Syrian negotiations. It seems that UN respects Russia’s stance on the issue of the Kurdish minority in Syria. Staffan de Mistura, the UN’s special envoy, said that the world organization is seeking to find ways to engage the Kurds in the peace talks. The Kurds represent the second largest ethnic group (about three million people) residing in Syria. They chose not to participate in the civil war and still maintain their neutrality. Kurdish leaders stress that they neither seek independence nor support a dissolution of Syria. What they want is for their ethnic rights and freedoms to be set out in the country’s new constitution. The Kurds also confirm their commitment to cooperation with any Damascus authorities as long as they acknowledge the equality of rights. In addition, the Kurds propose to be a mediator or observer in the settlement of the intra-Arab conflict. They believe that they geographic location—half-way from the current state administration and from the forces of the opposition—would render them to be the best choice for this role. Back in 2012, the Kurdish communities of the town of Aleppo and of three Kurdish enclaves in the northern region of the country, left by Damascus to their own devices, were able to promptly self-organize themselves. 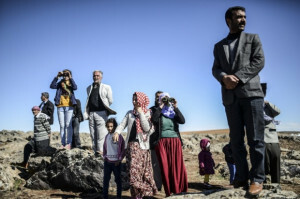 They created quite effective autonomous bodies and formed self-defense militia groups that successfully countered all attacks of radical Islamist groups and took control over a larger part of the Syrian-Turkish border. On January 21, 2014, the Kurds declared the establishment of an autonomous region known as Rojava (Kurdish for “Syrian Kurdistan”). The Syrian Kurds were recognized for their struggle against international terrorism. Even the US and its western allies closely cooperate with Kurds in the fight against Isis and Jabhat al-Nusra. Allegedly, about 100 American soldiers have been present in Rojava for several months now, participating in special operations, coordinating their actions with the combat operation plans of the Kurdish militiamen. And the US air forces use an airport located near the town of Rumelan, controlled by the Kurds, to deliver weapons, ammunition and supplies to the Kurdish militiamen. It is noteworthy that Russian aerospace forces also closely cooperate with the Syrian Kurds. Kurdish delegations have regular meetings with the Foreign Ministry of the Russian Federation and actively participate in a dialogue on the settlement of Syrian crisis. It seems that the world community is gradually developing an understanding that it would take the participation of the Kurds for the Geneva talks to be meaningful. Most probably, Bashar al Assad will have to come to terms with this fact. However, there remains an issue of what political forces should represent the Kurds in Geneva. Another topical issue is what delegation (government, opposition or independent) representatives of the Kurds should be included into. The Supreme Commission for Negotiations formed by the opposition in Riyadh stated that it supports Kurd’s national identity and already has Kurdish representatives on its delegation participating in the Geneva talks on Syrian peace process. Kurdish National Council in Syria that considers itself a key member of the Syrian opposition believes that the honor to represent the interests of Syrian Kurds at the peace negotiations in Geneva belongs to it. The Council alleges that more than 600,000 thousand Syrian Kurds signed a petition recognizing Kurdish National Council as their diplomatic representative (Kurdish National Council is actively supported by the Iraqi Democratic Party of Kurdistan (DPK) and personally by President of Iraqi Kurdistan Masud Barzani). Kurdish National Council was established on October 26, 2011 in the capital of Iraqi Kurdistan, Erbil. The Democratic Union Party (PYD) headed by Saleh Muslim Mohammed also claims its right to participate in the Geneva talks. Autonomous bodies and the People’s Protection Units in Rojava were created through the efforts of the PYD. Today this party remains the leading military and political force of the Syrian Kurds. It controls approximately 500 out of 800 kilometers of the Syrian-Turkish borderline. In 2015, combat operations of the PYD and the People’s Protection Units against Islamists were the most successful to compare to other militiamen groups. Through their efforts the territory of Rojava almost doubled. It is no secret that the PYD is loyal to Damascus and does not consider itself an opposition party. The ultimate goal of its leaders is to establish an autonomous Kurdish region in the framework of a federal Syria. Despite criticism voiced by Turkish authorities and some opponents in Rojava, the leadership of the PYD is finding ways to account for the interests of all ethnic, religious and political groups of the region when forming regional and local authorities. Arabs, Syrian Turkmen, Assyrians, Armenians and representatives of other local ethnic groups are fighting in the ranks of the People’s Protection Units. Its opponents in the Supreme Commission for Negotiations and Kurdish National Council believe that since the PYD supports the regime of Bashar al Assad, it should participate at negotiations in Geneva as part of the government delegation. Ankara perceives the PYD as a branch of Kurdistan Workers’ Party (KWP). For this reason, it is automatically classified as a terrorist organization and is considered by Turkey, the US and a number of other western countries a terrorist organization. Turkish leadership does not hesitate to play this card when demanding from UN and its western allies to ban PYD delegation from participation in the Geneva talks. Having wedged an open war on its Kurdish minority, Erdogan and his entourage freak out every time the issue of autonomy of the Syrian Kurds (in any format) is raised. Turkey perceives the prospects of Rojava receiving international recognition and a status (even in the format of the autonomous Iraqi Kurdistan) as a threat to its national security and territorial integrity. However, despite the pressure Turkey exerts on UN and its western NATO allies, the Syrian Kurds will most probably participate in the Geneva talks (in one way or another) and will decide the fate of Syria and determine the country’s future political order. Today it became clear that the Kurds represent an integral part of the Syrian society. They participation in the struggle against radical Islamist groups had won the Kurds the right to represent the de facto established Kurdish autonomous region at any international forums or negotiations deciding the fate of the new Syrian state.